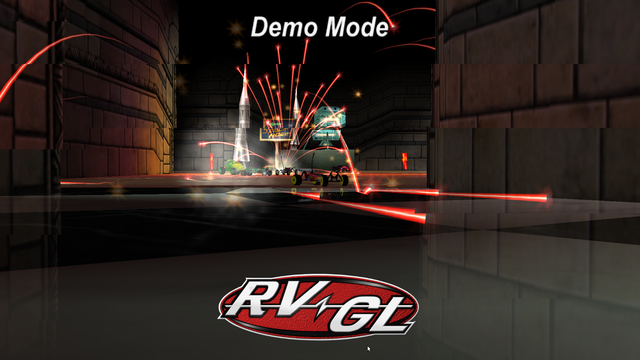 RVGL is a reimplementation of one of my favorite games of all time Re-Volt. And thanks to the RVGL Team and especially (Huki and jigebren) we are now able to play this awesome game on ODROIDs thanks to GLshim from @ptitSeb. If the folder does not yet exist, just start the game once and it will be created. Please checkout http://www.re-volt.io/downloads#game-files for more information about what files you need and some legal concerns about the game. Have fun with this awesome and very impressive game and thanks again to everyone who made this port possible. It looks very attractive to RC car manias too. I am downloading 170MB of game files now. Thank you very much for this great port! After installing and copying all the files, I get this error message: "Can't find any languages"
Any idea of what I am doing wrong please? 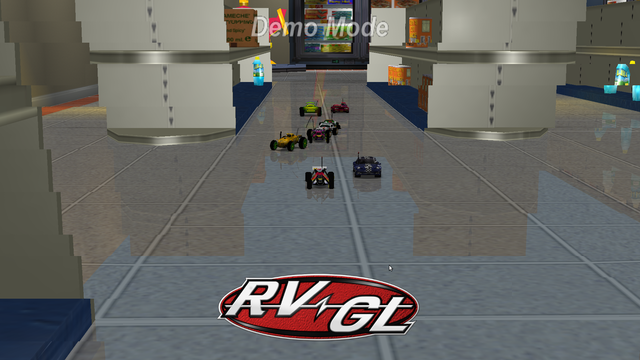 Have you installed the files from the original Re-Volt game? They are required as well. Can you compare with the tree command that I posted above that all files are and in the correct folders? Normally there should be a very long list of files that were or were not renamed.. I'm missing that in your output. New version from Huki which fixes a bug in Joystick deadzone calculation as well as heavy code refactoring. I improved the starting script which now has an option to download the game data files. I copied the files from the link you provided on your first post, I picked the version with the soundtracks included. The folder structure looked the same as yours (unless I missed folders when I checked this part). Anyway... I will test your new install and let you know... I'm sure it's going to fix the problem. Man, you just brought my childhood back!! This is awesome! I never thought I will see that game again. Thank you! when i`m trying to start game, files don`t download. window in gui disappears after choosing "with music or without"
unzip: cannot find or open rv_gamefiles.zip, rv_gamefiles.zip.zip or rv_gamefiles.zip.ZIP. I'll add this to the package dependencies. new package uploaded with new dependencies that should fix all issues. Oh yeah... Re-Volt was awesome! If I remember correctly, I had unlock everything . I then started to contruct tracks which were only finishable by specific cars . Is it because of th other architecture, why it is not compatible (yet)? exactly... this is the armhf version and only works with armhf drivers at the moment. I was actually working on arm64 version yesterday, but it gives me a segfault during start, so I have to look into it. meveric wrote: exactly... this is the armhf version and only works with armhf drivers at the moment. No problem . Let me know, if I can help somehow. Looking forward to enjoy this game again! The other missing dependencies I could solve by myself. But this one is pretty hard . Would you give me a hint please? libenet7 is a library available on Debian Jessie, not sure if it exists on Ubuntu. It can probably just copied over from Debian if needed. meveric wrote: libenet7 is a library available on Debian Jessie, not sure if it exists on Ubuntu. Yes, I hoped to be able to install it by adding your Jessie/main repository. But no . If it could be copied from Debian to Ubuntu, how do I accomplish that? Where do I find it and where do I have to copy it to? Does the library then need to be "registered" or something else? But I can't find a download link for the armhf version. In addition it is for xenial and not for trusty . Now I need to check if I get the game running! I keep you updated. Last edited by Jojo on Wed Jun 01, 2016 4:53 pm, edited 1 time in total. Jojo wrote: Yes, I hoped to be able to install it by adding your Jessie/main repository. But no . That's no surprise I only provide software that is NOT available on Debian repositories. Why would I provide packages that are already in the repository? Jojo wrote: If it could be copied from Debian to Ubuntu, how do I accomplish that? Where do I find it and where do I have to copy it to? Does the library then need to be "registered" or something else? seems like we both were typing . I managed to install the lib and the game. Thanks for your effort! AWESOME! I can confirm that RVGL runs fine on the ODROID C1 with the official HK Ubuntu! Thank you @meveric and all the team around RVGL! One small "negative" note (not really negative in relation to this great game ): in some situations the FPS rate drops heavily to <10 . But for me its ok anyway ! Jojo wrote: AWESOME! I can confirm that RVGL runs fine on the ODROID C1 with the official HK Ubuntu! Thank you @meveric and all the team around RVGL! Well the C1 is not the most powerful device there is. So it's really not a surprise that FPS drops here and there. Actually even the XU4 has some low FPS sometimes (complicated map with lots of effects and cars), but most of the times it plays very well. Yep, for me it's completely OK .
Did you guys also notice the "dev" bug? 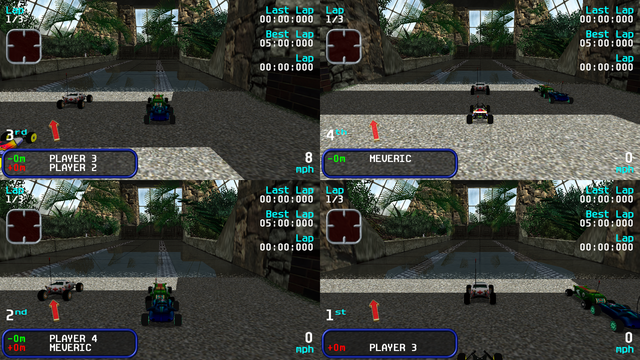 When I scroll through the menue when there is the "room" in the background, every second menue entry change seems to unlock some kind of "developer" mode, where all cars and tracks are unlocked (all boxes are open and there is "dev" in the bottom-right corner instead of the version). So if I do the right combination of menue-entry-changes (just up/down), I am even able to play every track with every car . Actually I think that's suppose to work if you press left and right on the menu, so you don't need to time any menu-entry-changes, just press left or right on the option you want. But yes I've noticed that too. I'm gonna ask Huki if that's intended or a bug. C0 => custom portable retrogaming "GameOdroid C0"
I'm trying to make it work on my C1 but I only get a blank screen (using jessie from meveric, clean install). Are you using it from an X11 desktop, or are you trying to run it off the terminal? I start it from a term in X11, no desktop manager installed. So in fact from the base install, I launch "startx" then the game from the default xterm. after a reboot, the game is now launching with no error.... but I only get a very few part of the screen with the game display (it seems to be the left bottom corner). I'm using a little html display (5 inches) in 800x480. Your work is much appreciated! I maintain the Re-Volt community website, formerly re-volt.me. You just have to swap me and io. I'll soon upload them to the server itself so that the download script works again. Thanks alot for the info. Please let me know when you've uploaded directly to the site so I can rework the download script. There you go! Please let me know if there are any problems. Do you know if there were any code changes lately that I should contact Huki about? The only major recent thing is P2P, though. We had some online races recently and it works really well. I just finished uploading a new version of RVGL, first time with arm64 support, thanks to @Huki who's developing RVGL and fixed an issue with the arm64 version under Debian Jessie. - Updated the Spanish translation for Instances option in Render Settings. message is now logged instead. - The external IP service provider is now changed to 'www.myexternalip.com'. line to explicitly disable P2P and use client-server mode. from the debug display in Dev mode (Ctrl + Numpad Enter). build 15.0325 that was intended to improve stability at high fps. longer dependent on the frame rate. - Fixed audio clipping at high frame rate. be able to see each other. - Fixed lobby timeout not giving any error in the previous release. - Fixed bad 'player leaving' message sent by clients in P2P mode. - This release includes additional Gallery pages from the DC version. - Replays are now saved per-profile when using the Save Replay feature. - Added missing entry for libGLEW.so.2.0 in the rvgl launch script. - The changelog is now saved in UTF-8 encoding. - Lobby connection timeout is reduced from 60s to 15s. - Possible alpha transparency glitch in saved screenshots. still at the sync screen. - Added missing texture files for the Trolley car. - New implementation of multisample anti-aliasing using Framebuffer objects. - Added libsndfile decoder to support various compressed WAV formats. the total number of world + instance collpolys can now exceed 65536.
now restored based on the original DC version. - Improved logging to display additional details and log error messages. this setting currently requires restarting RVGL to take effect. - Updated the Dreamcast pack with the latest files. - Localized the "Windowed" text in Video Settings. - Log the OS and architecture to the re-volt.log file. - Debug display is now invoked with Ctrl + Numpad Enter (Dev mode). - Show lag and interval values in multiplayer debug display. - Car / object position updates are now sent in a separate enet channel. - Fixed bug in .lit file saving in Lights edit mode. - Fixed crash after selecting give up try in Championship mode. properly sets any extra players to spectating mode. - Ensure remote car orientation doesn't deviate too much from correct angle. - Restored the remote object delay (to a lesser extent than before). - Weapon transfer now uses guaranteed messaging. - Show CHT if the player has entered dev mode. all carboxes displayed on screen). - Support for modern game controllers like the Xbox 360 and PS3 Controllers. button names are displayed in the Controller Config menu for these devices. even if the level data is missing. - Linux 'setup' script now sets proper permissions to the 'lib' folder. - Increased the enumerated number of display modes to 1024 (previously 256). The number of display modes is logged to the re-volt.log file. Pause - backwards (Button Y by default). - Disabled the delay added to the multiplayer cars and objects animation. even at high pings without the need for adding a remote delay. - Increased the network packets per second to 20 (from previous 6). - Improved debug display in multiplayer (Numpad Enter in Dev mode). - Bug restarting level in reverse / mirror mode in split-screen. Multiplayer CPU setting is turned off. - Possible crash when the number of display modes is above 256. - Improper menu layout when the window is resized while the menu is animated. - Menu navigation not working when controller axes are used as buttons. - Track search unavailable when going back from waiting room. - Wrong weapon target when using the 'all weapons' cheat in multiplayer. - 64 bit builds are now available for Windows. (available as a separate optional download). - Support Rooftops models, sfx and skybox in the Objects edit mode. were found to not load in v1.2 and older versions. - Increased the sfx range to be closer to 1207 behavior. - Disabled the exponential volume curve introduced previously. - Bug selecting 'no' during championship give up try. - Fixed a bug in 3D surround panning. and 64-bit systems (rvgl.32 and rvgl.64). dependencies by using libs included with rvgl in place of any missing libs. distros as long as the opengl drivers, sdl2 and sdl2_image are installed. is now closer to the 1207 / DC version. - Updated the Linux build for Ubuntu 16.04 support. - Avoid renaming dll files when running the fix_cases script. - Fixed TAB and F11 keys not working when caps lock or num lock is on. - Updated fix_cases script on Linux to avoid renaming the lib folder. - Reverted lag management change from 16.0315a as it can cause jittering. - Fixed crash introduced by the water box fix in last release. 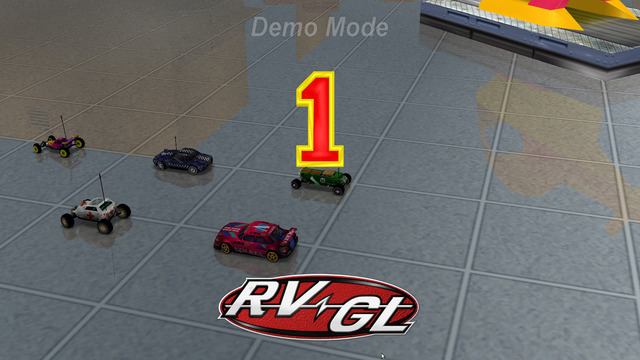 The new version also includes bonus cars and an additional track from the dreamcast version of the game. When I install libglew-odoid, it always installs the armhf version and the armhf version of libgl-odroid as well. Do you know, what I might have missed? I haven't build any libglew specific packages for C2 (means there is no libglew-odroid package), libglew1.10 is stock Debian Jessie library which doesn't seem to be available on Ubuntu. You probably have to download the library manually. meveric wrote: I haven't build any libglew specific packages for C2 (means there is no libglew-odroid package), libglew1.10 is stock Debian Jessie library which doesn't seem to be available on Ubuntu. Ah, stupid... I got it. In my package list, there was the package "libglew1.13". I installed that, because I thought that it is ">= 1.10.0". But now I understand, that the "1.10" is essential . Then the screen gets black, and then I am back at the login greeter screen . Any ideas? I can check on the strings error which might be a permission issue within the packages itself. But what ever causes the system to crash to login greeter I don't know. In the end I'd suggest using Debian Jessie instead. confirmed, there was a permission issue on the strings folder within the package, which I fixed and I just uploaded a fixed version. meveric wrote: In the end I'd suggest using Debian Jessie instead. performance on the C2 is good. You can play the game in full speed without lagging although it's slower than on the U3 (haven't tried C1 lately). Ok, I got it working on the C2 using the original HK Ubuntu. I've tried it on another C2 with a "more original" OS, and it worked without any problems (after installing libglew1.10 manually). I don't know where the problem is on my other C2, but anyway... I am happy to confirm, that it is generally working very well! Is there any chance to see a fbedev version (odroid c1) ? Hmm not sure, it would probably be rather complicated, since it's heavily relying on OpenGL and SDL2. gl4es supports fbdev, but SDL2 could be tricky. It's a rather big task and I normally avoid something like that, since I believe only a few people use fbdev and the C1. ha, ok... I did not know that SDL2 was not supporting fbdev. Well I may use the dreamcast version of this game with reicast. maybe you should considering compiling directly on the ODROID rather than in buildroot. Furthermore the engine was completely rewritten and now supports native GLES rather than using gl4es as a wrapper. I also allows the usage of OpenGL ES 2.0 shaders. Where GLProfile = 1 would be OpenGL GLProfile = 2 is OpenGL ES. Shaders = 0 would mean OpenGL ES 1.x without shaders. Shaders = 1 would mean OpenGL ES 2.0 with shaders. On the first start the game automatically should start as OpenGL ES so there's nothing much you need to do. You can however activate Shaders if you want to. Great to see another decent native GLES game. Great ! And it is getting even better! On official stock Ubuntu, rvgl-odroid could not be installed directly, because the libunistring0 was missing and not installable. Then the installation works and the game runs perfectly !